How to create, edit and delete reusable offboarding task templates anytime from company settings. Already started terminating an employee? 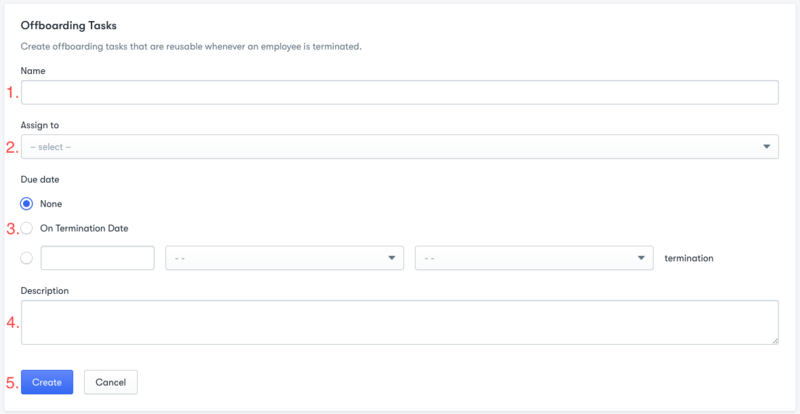 You can still create Offboarding tasks while in the termination process by following the steps in this article. Note: Tasks that are created in the termination process will not be saved as templates. The first thing you will have to do is navigate to the Offboarding Tasks page. You can do this by entering the company settings, scrolling down and clicking this section. Now that you are on the task template page you can see a list of the tasks you have made previously. If this is your first time creating an offboarding task this page will look a little empty. Here is how you can change that change that! To create a new task template you are going to start by clicking on the blue + Add Task Template button in the top right corner of the page. From here you will be brought to an easy to use base template for your offboarding tasks that will look something like this. 1. The first step is to name your task. Some examples of this could be return company keys, or clean out desk. 2. Next you will choose who this task will be assigned too. To do this you will click on the drop menu and select the assignee. The task can be assigned to the the terminated employees manager, the employee, or to any other employee (listed by name). 3. Here you can select the due date of the project. The task can be set to be completed for the termination date, or a set amount of days before or after the termination date. 5. Thats it! Now that you have fill everything out it is time to save your task by hitting the Create button. If you aren't totally happy with it don't worry, you can create the task now and come back to edit it later. Now that you have created your offboarding tasks, you may decide that you want to edit one, or maybe you realized you don't need one and want to delete. Here is how you can do that. When on the task template page you will have to click on the three dots next to the task. This give you a drop down with the options to edit and remove your task. When you select edit you will be brought to a page that looks the same as the page you use to create the task, but with all of the information already filled out. You can easily edit any of this info by clicking on the field you wish to change. When the task is edited how you would like, select the save button at the bottom of the screen. 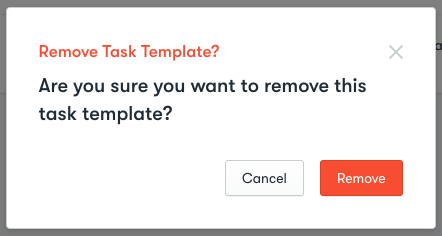 When you've decided that you want to delete a task template and you have selected Remove from the drop down, you will see this pop up. Simply select Remove to permanently delete the task template. Note: This will not delete tasks that have already been assigned in the offboarding process. Deleting task templates is irreversible! Be certain that you no longer want the task before clicking remove.